Citgrower - Kenya Biologics Ltd.
Cytokinins in CITOGROWER stimulate cell division and cell elongation, increasing the size of the cells by induction of protein synthesis. This results in healthier plants and increased crop production. Application of CITOGROWER promotes production of longer and more homogeneous fruits, which keep their flavor and consistency after harvest for a longer time. Other benefits include delayed senescence of leaves and better plant growth, being the result of a stimulated metabolism. Plants absorb rapidly CITOGROWER, for maximum nutritional benefit. 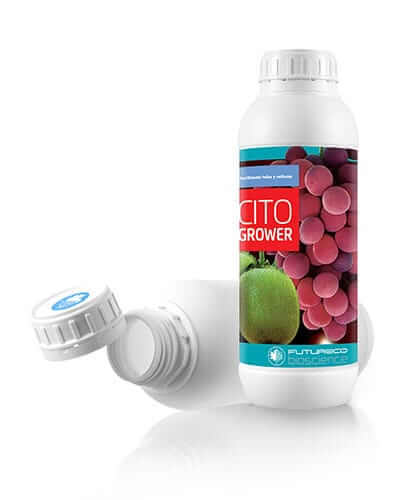 Applications of CITOGROWER are recommended to improve fruit development. Use in foliar spraying after flowering. Rate and frequency of applications may vary due to active growth and particular crop conditions. CITOGROWER is stable for at least three years since manufacturing date. Store in the closed original container in a cool and ventilated area. DO NOT store for prolonged periods in direct sunlight. Keep away from food, drink and animal feed. Keep out of the reach of children. CITOGROWER is compatible with Giberellic Acid (GB3) and most pesticides and fertilizers. For application with plant protection products follow pesticide label directions and make jar test for compatibility. Contains active cytokinins equivalent to 1%.It is also available at cytokinin concentrations of 2% and 4%. Composition is subject to change according to the local regulations for such products. Grapevine 100 Apply along GB3 for berry growth. and 28 days after full flowering. Strawberry 75-100 Apply 10 days after full flowering. Pome and stone fruit trees 75-100 Apply 10 days after full flowering. eggplant, etc.) 75-100 Apply 10 days after full flowering. Cucurbitaceae (cucumber, zucchini, etc.) 75-100 Apply 10 days after full flowering. Legumes (broad bean, green bean, pea, etc.) 75-100 Apply 10 days after full flowering.